Members of Laborers' Local 261 picketed at the area where the Ruth Asawa School of the Arts once stood at the corner of Font Boulevard and Tapia Drive. The local construction worker union was protesting since 7 a.m. Sept. 14, 2012. Photo by Elissa Torres. A group of men stand by the piles of rubble where the Ruth Asawa School of the Arts once stood. Outfitted in orange vests, hoisting picket signs, these men — members of Laborers’ Local 261 — have been protesting the presence of Virginia Emerson General Engineering Inc. since 7 a.m. today. V.E.M. General Engineering Inc., hired by SF State, is clearing the area to make way for a 2.5 acre recreational green space that will debut Spring 2013. Laborers’ Local 261, the local construction worker’s union, has tried contacting V.E.M. for a week because they are not a union company. Left with no response, Laborers’ Local had come to the decision to picket three days ago. Megan Martenyi, a women and genders studies graduate student, disagrees with SF State’s hiring choice. “I think SF State made the wrong choice by not using union labor,” Martenyi said. According to Scott, V.E.M. General Engineering Inc. pays unskilled workers $10 per hour, as opposed to the $26.89 per hour that union pays. For Oscar Ramirez, a father of four that has been working for the union for 23 years, this affects the amount of money that comes in for him and his family. 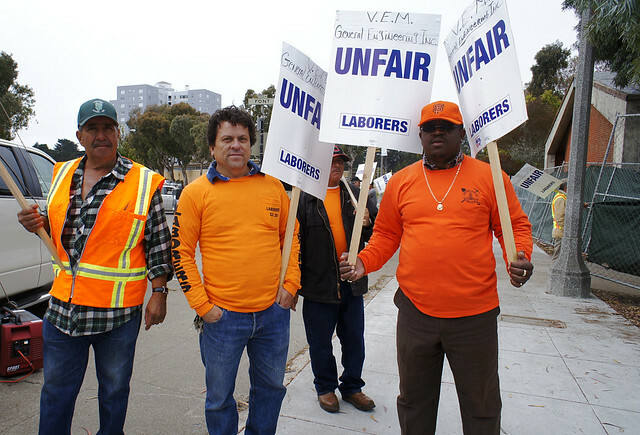 Laborers’ Local 261 tried to contact and resolve the issue with V.E.M., but there was no response. By not using unionized labor, money is possibly not going back into the city and helping its residents. Other concerns are the cleanliness of the construction site. According to Scott, the path from the road to construction site should be clean, but it isn’t. “How do we know that the dust in the construction site isn’t contaminating the students, faculty and people that pass by,” Scott said. Scott just wants to ensure the safety of the people that surround SF State. V.E.M. General Engineering Inc. was contacted and has no comment regarding the picket line surrounding the area.